This report, the 25th in the series, contains information about the aquatic animal health status of fifteen states in the Asia-Pacific region. The foreword discusses the outcomes of the third meeting of the Asia Regional Advisory Group on Aquatic Animal Health. 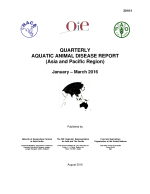 The Quarterly Aquatic Animal Disease report provides information about the status of aquatic animal disease in 21 participating states in the Asia-Pacific region. 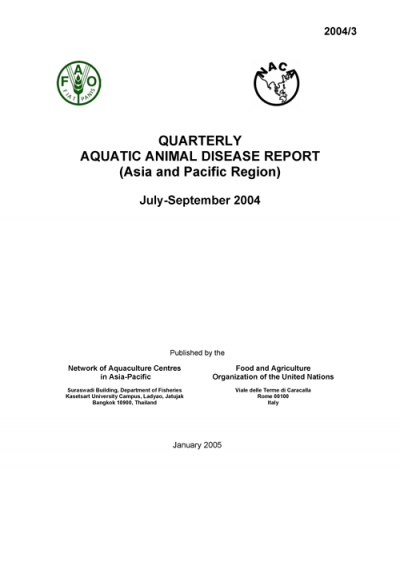 The diseases covered in the report are reviewed annually by the Asia Regional Advisory Group on Aquatic Animal Health. The report was first published in the second quarter of 1998. It is a joint activity between NACA, FAO and the OIE Regional Representation (Tokyo).